On 26th January, the European Commission launched the celebrations for the 30th anniversary of Erasmus+. The campaign kicked off with a festive launch at the Parliamentarium in Brussels. 2017 marks the 30th anniversary of Erasmus - one of the most successful programmes of the European Union. Established in 1987 as a student exchange programme, it has since given 9 million the chance to live abroad. Over the years, the programme has continuously grown, bringing all the EU's schemes for education, training, youth and sport mobility under one banner. Today, Erasmus+ brings far-reaching benefits to Europe. It is widely said that Erasmus plays a significant role in fostering European identity and improving youth employability. The anniversary campaign began with a press conference held at the European Commission. In a room filled with journalists, Commissioner Tibor Navracsics highlighted the impact and reach of the Erasmus+ Programme, simultaneously releasing the latest figures. Joining him onstage with personal testimonials were Erasmus+ alumni, Michael Ward and Simona Bisboaca. The opening speeches were followed by a question-and-answer panel with the audience, tackling the topics of European integration and the future of the programme. The launch event, held at the Parlamentarium on the other side of the European Quarter, saw a ceremonial opening with a performance by our very own Kelly Claeys, member of ESN Belgium. The ceremony was graced by the presence of Commissioners Tibor Navracsics (Education, Culture, Youth and Sport) and Marianne Thyssen (Employment, Social Affairs, Skills and Labour Mobility) as well as Ms Silvia Costa MEP. A notable announcement made during the event was the establishment of the new 'Erasmus Pro', an initiative that aims towards 1 million young European apprentices by 2020. The floor was shared with Erasmus+ ambassadors - alumni of the programme from its different funding opportunities, sharing their success stories. Besides live testimonials, the screening of inspirational video clips enhanced the message of the plusses in Erasmus+. ESN also saw a strong representation of over 20 members, demonstrating the support that the network has lent to the programme since its founding in 1989, two years after the establishment of the Erasmus programme. With such a festive opening, 2017 looks set to be an exciting year ahead, with a host of events organised on the European as well as national levels. 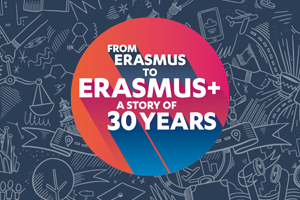 For more information, visit the official Erasmus+ 30th anniversary website and the Facebook page of Erasmus+.